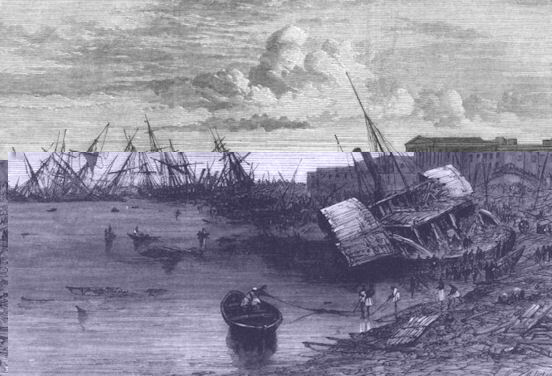 The LOSS of SHIPPING during the CYCLONE at CALCUTTA. Most of the information here is from the newspaper’s ‘The Daily News’ of 17th November 1864, and the ‘Lyttelton Times’ of 24th November 1864, and the books, ‘The Blackwall Frigates’ by Basil Lubbuck, and the ‘Report on the Calcutta Cyclone of the 5th October 1864’ by Jame Eardley Gastrell. The following is a destruction to life and landed property in the town and suburbs of Calcutta is gleaned from reports submitted by the superintendents of the different divisions to the Deputy Commissioner of Police, Captain Reveley: Casualties – Natives killed, 41; ditto wounded, 12; puckah houses occupied by natives damaged, 1383; ditto destroyed, 18; katcha ditto destroyed, 89,412; Europeans killed, 2; ditto wounded, 5; ditto houses damaged, 2296; ditto destroyed, 92. The total destruction of thousands of houses has subjected crowds of the natives to exposure of all sorts of weather; and this, combined with the wretched garbage on which they were living, will certainly produce bowel complaints and other diseases which will sweep hundreds into the grave. The cyclone caused a fearful destruction upon the port and its shipping. A 190 ships and boats were in the port at the time. ‘A. J. KERR’, (444 tons), wrecked. ‘AARON BROWN’, broke adrift in the Cyclone and went on shore at Seebpore, but has since floated; hull severely chafed and lost fore top-mast, jib-boom, etc., etc. ‘ADMIRAL CAREY’, (743 tons), in a paddy-field below the Botanical Gardens. ‘AGRA’, still ashore and discharging; may come off on these springs, but is considerably damaged. ‘ALEXANDRA’, (steam tug), arrived off town safely having in tow a ship. ‘ALEXANDER JOHN KERR’, with salt on board, capsized at Cossipore. ‘ALLIGATOR’ (steam tug), on shore at Culpee, but may possibly be got off, suffered considerable damage. ‘ALLY’ , (665 tons), with300 coolies on board, lost near Diamond Harbour. ‘ALLY AKBAR SHAH’, afloat at Clive South Ghat, but has sustained great injury. ‘ALPHONSE ET NELLIE’, afloat off Bang Bazaar, badly damaged. Rudder gone; ship a good deal chafed. ‘ALUMBAGH’, held on in the steam. ‘AMUN SHAH’, now afloat, we understand. Little or no exertion was used to extricate this vessel from her previous perilous position. ‘AMUNSHAH’, may come off before or on the next springs. ‘ANNE DE BRETAGNE’, afloat, but almost a wreck. ‘ANNE ROYDEN’, still ashore at Goosery, much strained and several feet of water in her hold; and discharging fast, may come off these springs. ‘ANNOT LYLE’, still on shore at Seebpore; jettisoning salt; may come off these springs. ‘APHRODITA’, stranded and badly damaged. ‘ARRATOON APCAR’ (steamer), totally dismasted, and all her deck works damaged, in safety and is being repaired. ‘ASTEROLD’, (475 tons), still high and dry at Cossipore; much strained, and almost a wreck. ‘ASTRONOMER’, afloat off Seebpore, damaged chiefly in rigging and bulwarks. ‘AZEMIA’, (1,179 tons), sank on the Howrah side of the river on the evening of the 5th. ‘AZZOPARDI’, still discharging; floated, but grounded again in a worse position. Now touching the bank. ‘BARON RENFREW’, (904 tons), totally lost near Diamond Harbour; crew saved and brought up to town in the steamer ‘Defiance’. ‘BEAUMARIS CASTLE’, safely moored off Howrah Dock, sustained some damage to masts, bulwarks, etc and making no water. ‘BENGOLLYAN’, still ashore above the Mint and discharging, but likely to get off on these springs. ‘BENTINCK’ (hospital steamer), (Government hulk), (1,200 tons), lost near Diamond Harbour, crew and invalids saved. ‘BOLTON ABBEY’, on Seebpore sands, jettisoning salt, is seriously damaged above gunwale. ‘BOTANIST’, still aground in a bad position; discharging; may came off on these springs. ‘BROUGHTON HALL’, still on shore at Ramkistopore, but chafed and damaged considerably. Discharging. ‘BURMAH’ (steamer), (B.I.S.S.Co.) sailed 1st Oct., believed to be safe. ‘C. N.’, now afloat; has bows, stern and bulwarks severely injured; makes no water, and will have to dock. ‘CALUMET’, Afloat, has lost mast and spars. ‘CAMA FAMILY’, ashore high and dry. ‘CAMPERDOWN’, safely moored; a hole in her bows and stern. ‘CAROBEL’, now afloat, but was on shore above Howrah Railway Station, sustained considerable damaged. ‘CARRIBEAN’, (874 tons), was ashore at Seebpore, now afloat, but badly hogged. Discharging. ‘CELINIE’, we learn, was not in dock, and did not capsize; has sustained considerable damage, and is a good deal strained. 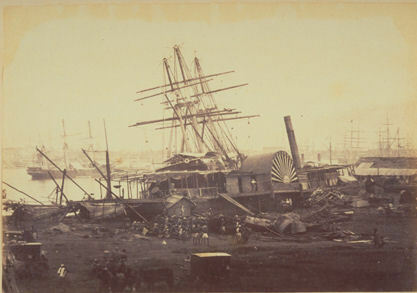 ‘CEYLON’, damage considerable, and will have to dock, later capsized in dock. ‘CHESHIRE’, now afloat, and making no water; will likely have to jettison salt, considerably damaged. ‘CHILDWALL ABBEY’, safely moored; reported that she will have to discharge two or three hundred tons, can be repaired without docking. ‘CHINSURAH’ (pilot brig), in position after the gale. ‘CIMANDEL’, lost foremast and was badly injured before the cyclone. ‘CITY OF LAHORE’, has sustained injury, and is discharging; still on shore, but may get off on these springs. ‘CITY OF PARIS’, still high and dry at Cossipore; discharging cargo, and will likely get off on these springs. ‘CLARENCE’, just arrived from England and safe after the cyclone. ‘CLYEMNESTRA’, float, topsides knocked away, stern stove in, damage very considerable. ‘COLLINGWOOD’, (680 tons), float; damage very considerable; will have to dock. ‘COLOMBO’, (932 tons), bound for Hull, great apprehensions are being entertained, it being supposed that she must have encountered the fury of the cyclone at the Sandheads, and no news of her having since reached town. ‘COMET’ (light vessel), in position. ‘CONFLICT’, just arrived from England and safe after the cyclone. ‘CONTINENTAL’, was on shore at Goosery sands now afloat, sternposts not gone, but will have to dock; jettisoned a considerable quantity of cargo. ‘COUNTESS ELGIN’, ashore but later towed off. ‘DINGO’, (631 tons), still ashore, on her beam ends; after-part of keel damaged and spars, anchors and chain gone. ‘DWARKANAUTH’ (steam tug), foundered with all hands. ‘EARL OF CLARE’, still on shore at Barnagore, but may get off soon, if the ballast is discharged. Sustained considerable damage. ‘EASTERN BELLE’, on shore at Cossipore; very much chafed; gripe gone. ‘ESMERALDA’, still on shore, but likely to get off on these springs; considerably damaged. ‘FEZ RABANY’ (827 tons), high and dry at Cossipore; bilged and almost a wreck. ‘FIRE QUEEN’ (steam tug), sunk. ‘FOAM’ (pilot brig), dismasted, will probably be towed in. ‘FORBAR’ (steam tug), afloat, but much injured. ‘FORGANHALL’, has left port in safety. ‘FRENCH EMPIRE’, is in safety; sustained considerable damage in her upper works. ‘FUTTAY ALLUM’, on shore at Goosery; several feet of water in her hold. ‘FUTTAY SHAH ALLUM’, on shore at Cossipore; may come off. ‘GENIL’, afloat; a good deal damaged. ‘GEORGIANA’, afloat; considerably damaged both in hull and rigging. ‘GLENROY’, still on shore in an extremely bad position; doubtful whether she will get off. Very much damaged. ‘GOVINDPORE’, (1,357 tons), laden for Mauritius, sunk off Calcutta. ‘GREAT TASMANIA’, (2,163 tons), still aground, and all but a wreck. ‘GUSTAVE ET LOUIS’, was high and dry at Prinsep’s Ghant, now afloat; lost her rudder. Discharging. ‘HAMPDEN’, still on shore above the Mint, not much injured. ‘HANNIBAL’, on shore at Seebpore; in an awkward position. ‘HANOVER’, (1,045 tons), still on shore on the Goosery sands in a precarious position in a very bad state; has discharged a large portion of her cargo. ‘HARRY WARREN’, afloat, and may be repaired without going into dock. ‘HERCULES’ (steam tug), sustained considerable damage, lost paddle boxes, masts, funnel, etc. ‘HOPE’ (light ship), foundered, all hands lost. 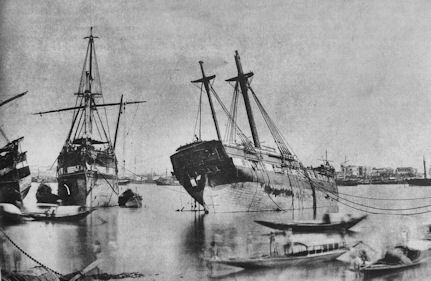 ‘INDIAN’, (450 tons), still on shore at Cossipore, somewhat damaged. ‘INTERLOPER’ (steam tug), afloat but very much injured. ‘JOHN CHISM’, now afloat, damage principally above water. ‘KEDGEREE’, (pilot vessel), masts gone, the bowsprit was blown out of the vessel. ‘KENYON’, still on shore at Cossipore; lost main and mizzen masts; hull apparently all right, and discharging; may be got off. ‘KING ARTHUR’, still on shore, very much damaged, and beginning to break up; has discharged most of her cargo. Not likely to come off. ‘KNIGHT COMMANDER’, stranded and badly damaged. ‘KRISHNA’, now afloat; masts and upper works gone, but hull not much injured. ‘KURIM SHAH’, Cannot ascertain that there is any such ship in port. ‘LADY FRANKLIN’, (1,187 tons), sunk off town. Crew saved, we believe. ‘LADY (or LORD) PALMERSTON’, still on shore, and considerably damaged; may come off these springs. ‘LADY RAWLINSON’, still on shore at the bottom of Garden Reach ; will probably be got off without serious injury. ‘LATONA’, still on shore at Seebpore, and considerably damaged; may be got off on these springs. Now discharging. ‘LEONIDE’, afloat, and reported perfectly tight, about 400 tons salt jettisoned. ‘LEW CHEW’, (854 tons) laden for Colombo, sunk off town, full of water, some of the spars and gear may be saved. ‘LINCOLNSHIRE’, afloat; masts and rigging much damaged, and will have to dock. ‘MACDUFF’, afloat, but badly hogged on the port side. ‘MADRAS’ (steamer), afloat, but considerably damaged. ‘MAHARATTA’, safe, but now reported to be considerably damaged. ‘MANILLA’, afloat, but has sustained considerable damage; will have to dock. ‘MARTABAN’, (steam tug), arrived off town, dismasted. ‘MARY STUART’ (steam tug), now afloat. ‘MAURITIUS’ (steamer), still on shore in a dangerous position on Howrah side; discharging; may come off with the aid of powerful steam on these springs. ‘MEDUSA’, still on shore at the Mint, slightly damaged; discharging; will probably come off on these springs. ‘MEGNA’, (Government Surveying vessel), high and dry at Kedgeree. ‘MERRIE ENGLAND’, afloat, but much strained. ‘METIS’, remains on shore, jammed up with other ships; will probably be got off without serious injury. ‘MIRZAPORE’, (paddle steamer), still on shore at Armenian Ghant; jettisoning salt; will probably be got off. ‘MONMOUTHSHIRE’, afloat, but much damaged in her upper works. ‘MOORSFORT’, now afloat, was ashore on Goosery sands; hull not damaged. Discharging. 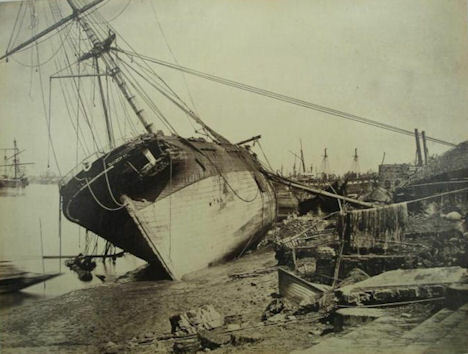 ‘MORAYSHIRE’, still on shore at Seebpore, considerably damaged. ‘MOULMEIN’ (steamer), afloat, and very much injured in upper decks. ‘NADA’ (steamer), still on shore off Clive-street Ghaut; will probably get off on the springs. ‘NAGASAKI’, at moorings, a little chafed. ‘NEMESIS’ (Peninsular and Oriental Company’s steamer), refitted, and is intended to take next mail. ‘NEWCASTLE’, still on shore at Seebpore, in a rather critical position, but has discharged a large quantity of cargo, and may come off. ‘NIMROD’, now afloat, very much damaged. ‘NORTH ATLANTIC’, the steamer ‘Thunder’ drove right over the wreck of the American barque and settled down across her poop. ‘NOUVELLE ASCENSION’, now afloat, but has sustained considerable damage; may be repaired afloat. ‘NUBIA’ (Peninsular and Oriental Company’s steamer) carries this mail. ‘OANITA’, now safely moored after having got clear of the wreck of the ‘Azemia’; damage comparatively small. ‘ORISSA’ (steamer), has sailed with the Madras Coast mails. ‘PERSIA’ (steamer), inward bound from Rangoon, foundered at sea with all her passengers and crew, with the exception of two lascars. ‘PHEONIX’ (steam tug), sunk, three of the crew saved. 'PHILBERT', (steamer), still on shore in a bad position, and shows signs of straining. ‘PILOT’ (steam tug), still on shore, may come off. ‘PRIDE OF CANADA’, still on shore in a critical position. ‘PRINCE ROYAL’, was shore at Cossipore, now afloat; ship quite tight, and will not have to dock unless false keel is injured, to be ascertained by divers. ‘PUNJAUB’ (steamer), still on shore shows no sign of straining. ‘QUEEN OF THE AGE’, still on shore, and a good deal of her cargo damaged; may come off. ‘RED ROSE’, ashore at Barnagore, now afloat, but very much damaged. ‘RENOWN’, saved itself by using of coir springs. ‘RICHARD BUSTEED’, still high and dry at Cossipore, with the loss of all her masts (excepting foremast), and other considerable damage; but may come off on these springs. ‘RIEVER’, (steamer), saved itself through the use of coir springs and carries the mails to Galle. ‘ROMANIA’, still on shore at Prinsep’s Ghaut; discharging, and has not sustained much damage. ‘ROYAL ALEXANDRA’, reported to be afloat. ‘SALWEEN’, (Government Surveying vessel), high and dry at Kedgeree. ‘SARAH AND EMMA’, being repaired afloat. Sustained some damage, having been fouled by the ‘Nemesis’ the morning after the cyclone. ‘SAUGOR’ (light vessel), in position. ‘SEA HORSE’, considerably damaged, but may be repaired afloat. ‘SESOSTRIS’, on shore at Cossipore, and almost a wreck. ‘SHAB ALLUM’, with pilgrims on board, was spoken going to False Point for water. Pilot on board. ‘SIMLA’, still on shore at Cossipore; jettisoning salt, but will likely come off on these springs. ‘SINGAPORE’ (French), (438 tons), sunk within the port. ‘SIR JAMSETJEE FAMILY’, still on shore in a very dangerous position, much damaged, and making a great deal of water. ‘SIR JOHN LAWRENCE’ 699 tons, afloat, a hole in her side, lost her main mast. ‘SIR JOHN LAWRENCE’, 1010 tons, afloat, lower masts gone, and otherwise much injured. ‘SIR ROBERT LEES’, held on in the stream. ‘SIR WILLIAM EYRE’, (1,315 tons), still on shore, much hogged and bilged. ‘SOLWAY’, still on the Goosery sands, almost a wreck. ‘SOPHIA JOAKIM’, still on shore at Cossipore; in a dangerous position and much injured, stem broken; but may come off. ‘SOUTHERN BELLE’, still on shore; not much damage except in rigging but may get off on these springs. ‘SOUTHERN CROSS’, still on shore at Nimtollah, doubtful whether she will get off. ‘SPEEDY’, now afloat, very badly damaged. ‘STAR’ (light vessel), has been towed up to town. ‘SYDENHAM’, just arrived from England and safe after the cyclone. ‘SYDNEY’ (steamer), now afloat at Cossipore, apparently only slightly damaged. ‘TALAVERA’, afloat; several holes in her side, may be repaired without docking. ‘TARAGON’, on shore at Howrah; in a very awkward position and badly strained. ‘TARTAR’, (647 tons), still on shore on the Goosery sands in a very dangerous position, and shows signs of straining. ‘TCHERNAYA’, (1,222 tons), still on shore on a brick Ghaut at Cossipore, a good deal damaged. ‘THALATTA’, afloat; considerably damaged, and will probably have to dock. ‘THAMES’ (country ship), (706 tons) on shore at Seebpore, a little strained. ‘THORNDEAN’, afloat in the stream, and a little damaged, can be repaired afloat. ‘THUNDER’ (steamer), still on the top of a wreck off Bankshall; great endeavours being made to save her. ‘TINTO’, on her beam-ends in dock, has been recovered, and is not much damaged. 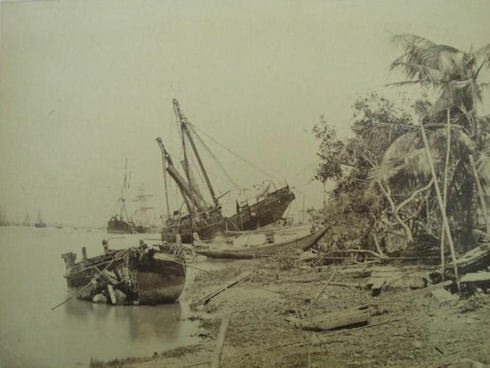 ‘TULJA’, (963 tons), still on shore at Cossipore, much damaged; masts gone, but making no water, and may come off. ‘UNION’ (steam tug), on shore at Seebpore, very much damaged. ‘VESPASIAN’, (919 tons), bound for Colombo, wrecked off Calcutta. ‘VICTORIA BRIDGE’, still on shore at Cossipore, with little chance of being got off. Has jettisoned a good deal of salt. ‘VILLE DE ST. DENIS’, bound to Mauritius, sunk off Calcutta. ‘VILLE DE ST. PIERRE’, (379 tons), on the bank in a very bad position; discharging. ‘WAR EAGLE’, saved itself through the use of coir springs. ‘WATERLOO’, afloat, but has sustained great damage. ‘WESTERN EMPIRE’, was ashore at Goosery, now afloat, but a good deal damaged, and will have to dock. ‘WESTERN STAR’, still high and dry at Seebpore, but much injured. ‘WIDE AWAKE’, very badly damaged. ‘WILLIAM FAIRBAIRN’, considerably damaged, but can be repaired afloat. ‘WINCHESTER’, on shore at Cossipore; straining a little; discharging. Tug-steamer ‘LADY ELGIN’ has returned from the Sandheads, and reports having seen a great deal of drift stuff; also that she picked up the maintopmast head of a large ship, painted white, in Balasore Roads. Other ships in port at the time of the cyclone, it will be understood, are in safety, or little injured. Of a very few, and these chiefly country ships, it is possible that we may not yet have ascertained particulars.